Asparagus is a member of the Lily family and is related to onions and garlic. 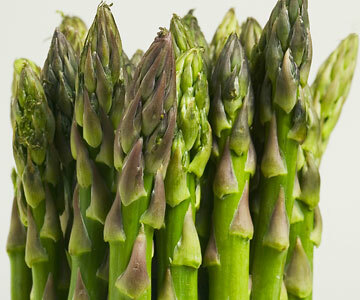 The asparagus spears grow from a crown that is planted about a foot deep in sandy soils. The spears are usually not harvested until the 3rd or 4th year, to allow the crown to develop a strong root system. The plants will then produce spears for about 15 years. Under ideal conditions, an asparagus spear can grow 10" in a 24-hour period. Each crown will send spears up for about 6-7 weeks during the spring and early summer. How often spears may be picked depends on the temperature. Early in the season, spears may be picked every 4 days or so, and later as the average temperature warms up, they may have to be picked every day!